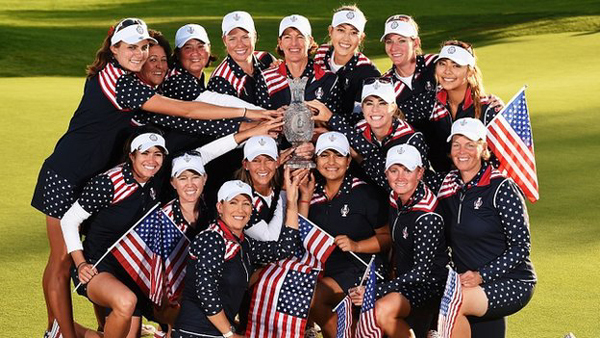 Suzann Pettersen and Carin Koch should be relieved that the United States Solheim Cup team staged their very own version of the “Miracle of Medinah” here. Because, even though the Scandinavian pair were unrepentant on Sunday night, had there been blue and gold flags waving triumphantly, the cascade of criticism would have engulfed Europe’s best player and captain. They were calling it golfing karma, although the remarkable Starred and Striped fightback from 10-6 down to prevail 14½-13½ for their first win in six years could in fact be traced back to something rather more tangible. Juli Inkster, the visiting captain, was certain that the motivation gained from the early-morning controversy during which Pettersen broke no rules but ripped up sporting ethics was critical in her team’s resurrection. Indeed they were and, as Melissa Reid – the Englishwoman who did not deserve to be on the losing side having won 3½ points from four – said, the US “went out with fire in their bellies”. As well as with conviction burning in their hearts. Not even the Ryder Cup, that team matchplay tinder-box, has had final-day drama on this scale. By 9.30am it had descended into acrimony, recrimination and tears. In a fourball match carried over from Saturday, Pettersen – who as the world No8 is Europe’s highest-ranked player – and English teenager Charley Hull were level with two holes remaining against Alison Lee and Brittany Lincicome. With a 12‑footer to win on the 17th Lee hit it approximately 16 inches past the hole and the rookie scooped it up. The 20-year-old claimed to have heard somebody saying “that’s good” and Hull seemed to be ­walking off the green towards the 18th. But Pettersen held her ground, saying that it had not been conceded and therefore had won the hole. Confusion reigned. Inkster struggled to contain her anger on the 18th green, saying: “If that’s the way you want it, let’s go.” As she did so, Lee and Hull were in tears being comforted by team-mates. Hull, 19, had just won her fourth match in four games but was in no mood to celebrate. Koch decided against instructing her pair to concede the 18th after hearing from Pettersen that she and Hull would not have conceded the putt to Lee, even though it was in tap-in territory. Koch also pointed out that Lincicome had shouted at Lee not to pick it up, but was “too late”. Koch defended Pettersen, calling the Norwegian’s actions “completely within the rules” and putting it all down to Lee making a mistake. Koch maintained that line afterwards with Hull denying she was walking off the green. For her part, Pettersen said that she would do the same again and was giggling and shrugging her shoulders during the press con­ference. Laura Davies, the veteran who has appeared in a record 12 Solheim teams, saw it rather differently. “I’m disgusted,” the Englishwoman said on Sky Sports. 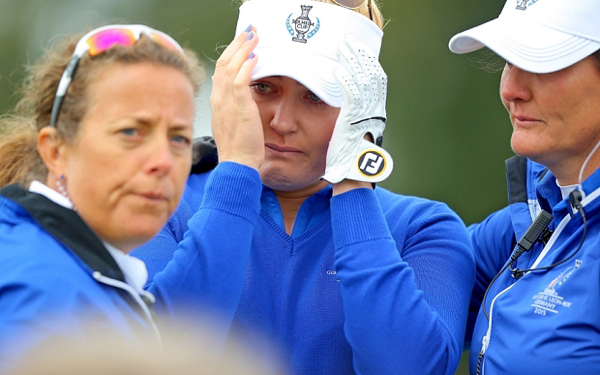 “Charley Hull has just won a point and she is in floods of tears. That tells you the wrong thing was done. How Suzann can justify that I will never, ever know. She has let herself down and she has certainly let her team down. And so the poetic justice ­unfolded. For the US there was the same requirement as there was for José María Olazábal in Chicago three years ago – 8½ points from 12 singles. Europe needed only four to retain the trophy and, in the lead match, Spain’s Carlota Ciganda missed a four-footer on the 18th for the win against Lexi Thompson which was to prove so costly. There were wins for Reid, France’s Karine Icher and the Swede Anna Nordqvist but down below, the scoreboard was covered in red with lee bravely bouncing back to beat Gwladys Nocera 3 & 1. Despite being three up after four, Hull was beaten 3 & 2 by an inspired Cristie Kerr. Caroline Masson had a 12‑footer on the 18th which would have guaranteed her team the tie but she dribbled it miserably wide before Gerina Piller nervelessly holed her 10-footer. With Paula Creamer so far in front of Sandra Gal, the only chance Europe had was with Pettersen. But Angela Stanford – who up to that point had lost nine matches in a row – closed out golf’s newest villain 2 & 1, on the green where, six hours before, Pettersen had caused Lee’s heartbreak. “That’s what bothered me the most – what they did to her,” Stanford said. “She didn’t deserve that and that’s what made me mad. This win was for her.” And perhaps, even for golf itself.